All-new Ford Focus revealed | What Car? You're looking at next year's all-new Ford Focus, revealed at the Detroit motor show today. It was unveiled in four- and five-door form and will make its first European public appearance at the Geneva motor show in March. Sales will begin at the start of 2011. Ford promises it will deliver best-in-class fuel economy and CO2 figures, along with major improvements in ride and handling, quietness, quality, safety and technology. 'From now on, we will establish fuel economy leadership with every new vehicle we introduce,' says Dr Jens Ludmann, the Focus's chief engineer. The car is the first to emerge under the 'One Ford' strategy established by chief executive Alan Mulally. In future, Fords all around the world will be based on common platforms. The new Focus will be made in Germany, Russia, America and China, with much of the engine production taking place in the UK. Ford plans a total of 10 cars from the new Focus platform, starting with the five-seat C-Max and seven-seat Grand C-Max compact MPVs next summer. Both were unveiled at the Frankfurt motor show last autumn. All the engineering and design work on the new Focus has been done in Europe. Martin Smith, head of European design, describes it as the company's 'star turn'. 'This is the new face of Ford,' he says. 'It is more sporty and sleeker [than the old model], with a lower silhouette (by 25mm), but the roominess and the package have not been compromised. The interior has also been designed around the driver. Ford says it meets the most stringent crash-test requirements all around the world. Full technical details are being held back until closer to launch, but Ford says the engine range on this side of the Atlantic will include the new Ecoboost range in the Focus's case, a 1.6-litre turbocharged, direct-injection unit as well as revised versions of its 1.6- and 2.0-litre turbodiesels. In America, there will also be a 2.0-litre Ecoboost option with a semi-auto gearbox. A full battery-electric version is planned during the lifetime of the car. The Focus is expected to use a development of the current car's fully independent suspension and have fuel-saving all-electric power steering similar to that on the latest Fiesta. It will be available with electronic cornering control to curb wheel slip in bends, as well as active cruise control, lane-change and speed-limit warnings, automatic control for the headlight beam and a low-speed anti-collision system like the one in Volvos. There will also be a semi-automatic parallel parking system and a new version of the central control unit that Ford calls HMI (human-machine interface). 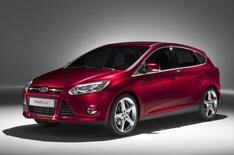 Major revisions to the S-Max and Galaxy spearhead the 11 new or updated models Ford will introduce in 2010. They get more efficient engines, fresh interior and exterior styling, extra in-car storage and additional safety features. They become the first models with Fords new 200bhp Ecoboost 2.0-litre direct-injection turbocharged petrol engine. There are also changes to the 2.0-litre turbodiesel, which is now available in the UK with two power outputs 137bhp and 160bhp. The updated models are expected to go on sale in spring.